CPC systems were born to create an alternative to conventional bladder tank systems. In contrast to the conventional bladder tank systems, foam concentrate stored in the pressure vessel is forced by using impellent gas to create an accurate mixture at the system outlet. While the system is in standby position, the foam concentrate tank is not pressurized, level measurement or replenishment is much easier than in the conventional bladder tanks. Pressure enters the CPC mixer employed simultaneously to proportion the foam concentrate ﬂow. A pneumatically actuated valve provided between the pressure vessel and the CPC mixer, isolates the line to ensure the foam concentrate consumption only when needed. A level indicator, pressure gauge assembly located on the shell helps the user to put the correct amount of foam concentrate in the vessel. Pressure vessel needs no maintenance while the pressurizing group needs to be supervised periodically. C.S.I. S.r.l. has obtained the H1 certiﬁcate according to the PED 97/23 directive. This certiﬁcate enabling our company to mark the CPC pressure vessels with CE. CPC systems are limited to 5000 liters capacity and equipped with up to 8” mixer providing a foam concentrate ﬂow rate up to 8100 l/min. 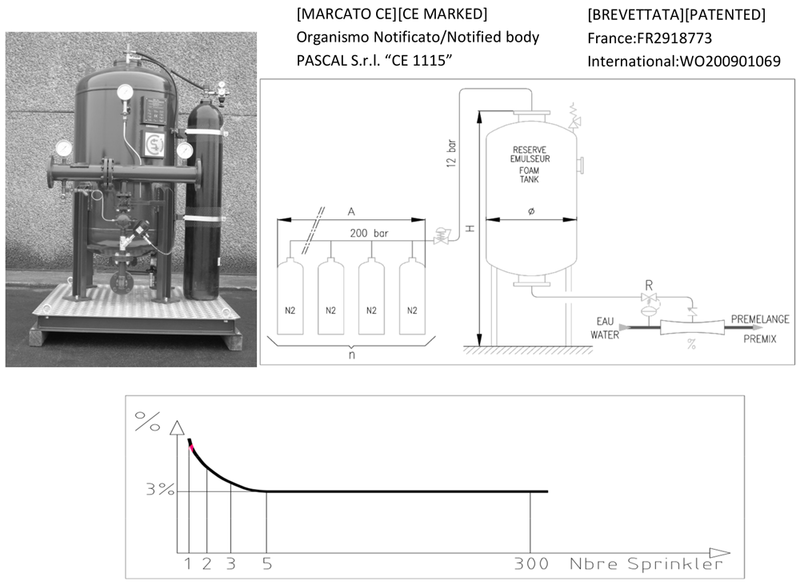 Le bombole di gas compresso (CO2, N2 o aria compressa) sono azionati dal flusso d'acqua che passa attraverso il mixer. La pressione del gas, convoglia il liquido schiumogeno (anche schiumogeni concentrati con valori di viscosità differenti) a fluire attraverso un orifizio calibrato creando un premiscelato con i desiderati rapporti di miscelazione. La perdita di pressione creata dal miscelatore è limitata a 1 bar alla portata massima indicata alla tabella dei mixer. Un regolatore di flusso auto bilanciato controlla la pressione della linea schiuma (indicato come “R” al disegno schematico) assicurando il corretto flusso del concentrato schiumogeno creando un preciso rapporto di miscelazione (1%, 3% o 6%).Il sistema funziona su una vasta gamma di portate come si evidenzia dalla tabella “Portate” allegata, miscelando perfettamente anche con valori di pressione diverse della pressione di ingresso acqua. Il serbatoio di stoccaggio può essere caricato facilmente anche con utenti non esperti. Il livello schiumogeno all'interno del serbatoio di stoccaggio può essere rilevato senza alcuna manovra. L’indicatore di pressione collocato sul collo bombola mostra lo stato attuale del sistema e il requisito per una eventuale manutenzione e/o riparazione. Soprattutto per i sistemi di spegnimento a sprinkler, il sistema si attiva con l’apertura di un solo ugello (sprinkler) miscelando correttamente su tutto l’ampiezza di portata. L’apparecchiatura normalmente è esente da manutenzione, richiedendo solo alcuni controlli visivi. Viene fornito un manuale di installazione e di verifica sullo stato del sistema. Pressured Gas cylinders (CO2, N2 or Compressed air) are actuated by the water flow passing through the mixer. 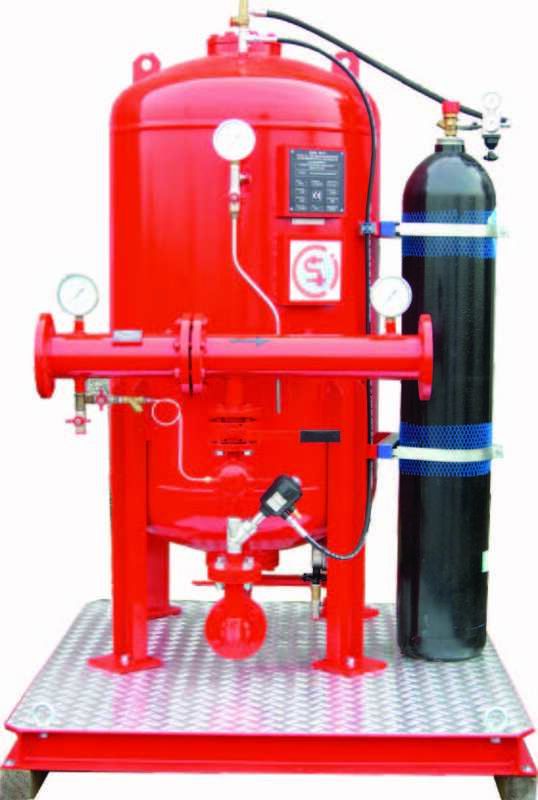 Gas pressure, forces the stored foaming liquid (Also foam concentrates with different viscosity values) to flow through a calibrated orifice to create a premix with desired mixing ratios. The pressure loss created by the mixer is limited to 1 bar at the maximum flow rate indicated at the mixer table. Pressure controlled foam line flow regulator (indicated as « R » at the schematic design) ensures the correct flow of the foaming liquid to create a precise mixing ratio (1%, 3% or 6%). System functions at a wide range of flow rates and also different pressure rates of the inlet water. Atmospheric storage tank could be filled easily also with non experienced users. Foaming agent level inside of the storage tank could be read easily. Pressure indicator located at the gas cylinder neck shows the actual state of the system and the requirement for the maintenance and repairs. Especially for the sprinkler systems, from one sprinkler operation to full system actuation, continuous correct mixing ratio guaranteed. Maintenance free construction requests some visual checks but no necessary maintenance or repairs. A user’s manual, for installation and the instructions to check the systems’ current state will be furnished with the product.